Short Mayo Composite aircraft. 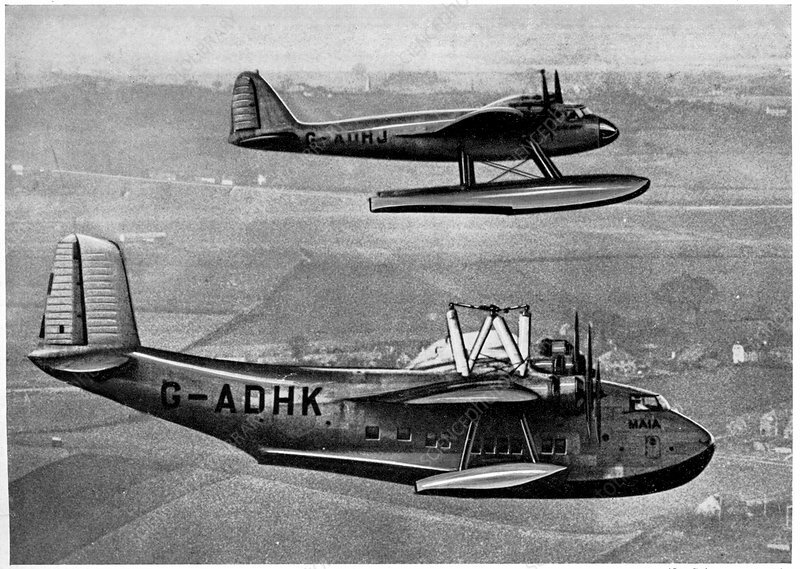 Historical image of the Short Mayo Composite piggy-back long-range seaplane/flying boat combination after in-flight separation. This aircraft was produced by the British Short Brothers in order to provide a reliable long-range air transport service to the United States and the far reaches of the British Empire and the Commonwealth. The two planes were launched together, with the smaller plane attached to the top of the larger plane. They would then separate in flight, with the smaller long-range plane continuing to its destination whilst the larger carrier plane returned to base. Image from 'Wonders of Peace and War', by Geza Supka, Hungary, 1939.